Left: For the very youthful bride Mary Brian offers a likely combination of souffle, lace and apple blossoms. The frock, which is delightfully jeune fille, is a piece of delicate workmanship, merging silken lace and cream souffle, into graceful lines. The veil is a shower of souffle, utilizing a band of cream satin to form half of the cap that fits snugly over the brides hair. Clusters of apple blossoms that point outward and brush the cheek take the place of the usual orange blossoms. A bouquet of apple blossoms caught with cascading ribbons is carried. The bride adds a triple strand of pearls to her lovely costume. Right: When time is short and the wedding takes place in the magistrates office and the next train or boat is caught for the honeymoon days, Nancy Carroll, Paramount player, offers us several chic suggestions. A slim tailleur in bright blue tweed is worn. The coat is a belted affair and the skirt is slightly circular. A jaunty blouse of egg-shell satin, a semi-beret hat in blue belting, a navy suede envelope bag and douskin gloves are also worn. 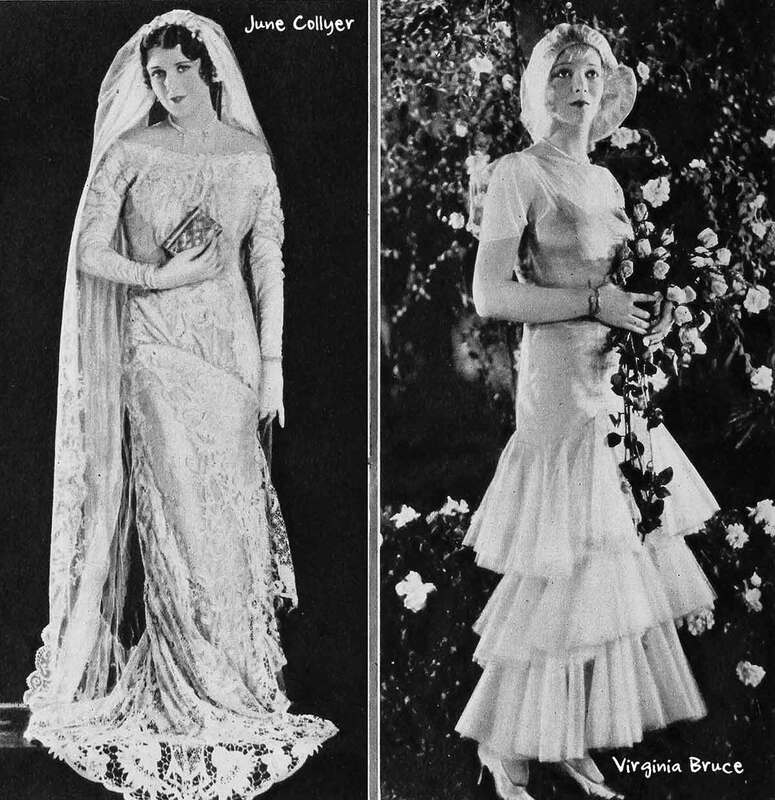 Left: The fortunate bride who discovers that her mother’s bridal gown and veil will create a picturesque costume for her journey to the alter, is illustrated by June Collyer. Miss Collyer wears, with intriguing results, the hand-made Edwardian lace gown worn by her mother. The fitted lines of the gown, designed to be worn over a corset, comply with the foundation wear of the 1930s. Miss Collyer adds a tulle and lace veil, caught in an old fashioned manner with orange blossoms well off her forehead. Elbow length gloves are worn and in place of a bouquet she elects to carry a beautiful mother of pearl prayer book. Divine ! Right:The midsummer bride might prefer the romance of a garden wedding. Virginia Bruce illustrates the proper costume for such an effect. A youthful frock of pale green net is created with a high waist-line, cap sleeves and a semi-bouffant skirt. An off-the-face hat of the same net is stitched into chic contours. A bouquet of yellow roses is carried, and a single strand of pearls is worn. Her slippers are dyed to match the hue of the frock. 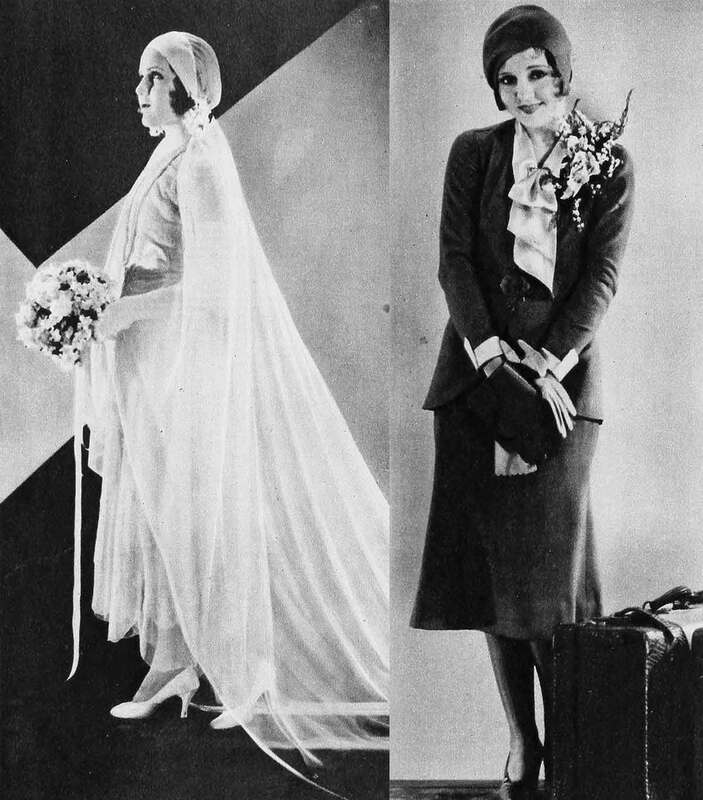 Left: Even a bride may elect a sophisticated mood for her bridal robes this season. Kay Francis suggests a striking manner of wearing a tulle veil. The tulle is caught over the head, covering the forehead in a snug cap effect. A second veil is caught under the chin, and crushed to meet the sides of the cap, thus covering the bride in a cloud of misty tulle. The gown, which is just discernible beneath the folds of the veil, is created in ivory chiffon, a fitted bodice and a trailing skirt of sunburst pleating. Shoulder length ivory suede gloves are worn and Miss Francis carries a sheath of Easter lilies. 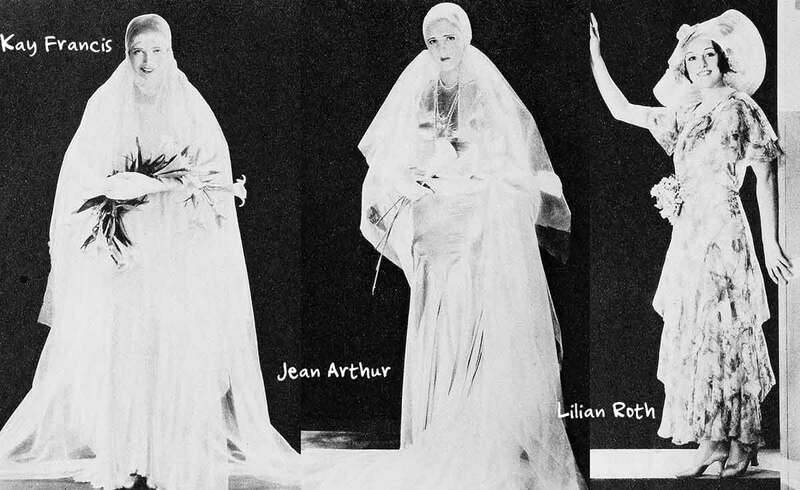 Middle: A 1930 mode for brides is introduced by Jean Arthur. Her bridal costume is an intricately cut affair of sheer blue velvet that falls from a high waist-line to a circular skirt and three-yard train. The unadorned tulle veil is also in blue, and is caught over the head in cap fashion without benefit of flowers or jewels. Miss Arthur adds shoulder length white suede gloves, pearls and an armful of calla lilies to the cool blue background of her bridal costume. Right: Lillian Roth offers modish hints for her second wedding. The costume for a second marriage should never include a trace of the first bridal robes. Extreme chic and dignity are the qualities to attain for such an occasion. Miss Roth wears a softly draped frock of flowered chiffon, utilizing such shades as dusty rose, cornflower blue and deep yellow. A large horsehair hat of dull rose is worn in the new off-the-face manner. A corsage of yellow orchids and lilies of the valley is worn at her waist.